Finding the suitable gift for a correct person can be tricky. When in doubt, give Chocolate it is affordable and practically guaranteed to put a smile on someone’s face. A classic conventional cake is quite common. Choose this delicious Two tier Chocolaty cake of Cadbury Dairy Milk to bring a charming smile on the face of your loved ones. This is the perfect gift for a pure Chocolate milk lover who enjoys the tastier things in life. A delicious sweet that melts in your mouth, sooths the mind and puts you on high spirits. This Dairy Milk Chocolate Cake is something special for someone special in your life. 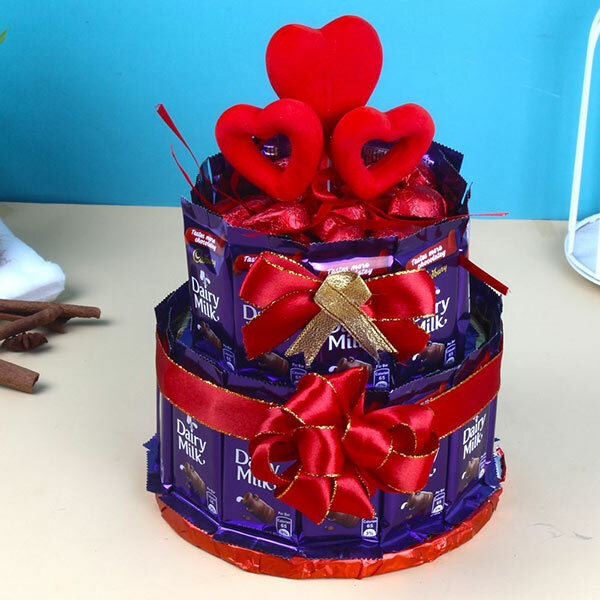 The most innovating idea to impress your receiver by gifting this double layered Dairymilk Chocolate Cake. No one can resist the Dairy Milk of devouring a mouth watering and delicious Chocolate . If gives a heavenly feeling. 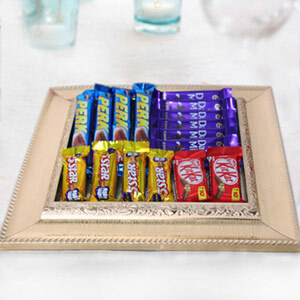 Treat your family and friends to delicious Chocolates. Old, young and small kids all are allured and fascinated to a Chocolates and which has been gift to someone as a precious Birthday, Anniversary or Mother''s Day gift. 2 Layers of Dairy Milk Chocolate Bars Cake (Weight : 300 Gms ) and Homemade Chocolate arrange on the top of cake (Weight : 200 Gms ) with 3 decorative stick.